I’m a big mask fan and knowing that My Beauty Diary has the best sheet masks, I picked up their Caviar, Rice and Pearl Powder masks (1). Have trialled Caviar yesterday, three words: oh my goodness. Another mask that was on my radar for a while now was Borghese Fango Mud Mask (6), which is a mask that helps to draw out impurities. I’m planning to use Tsururi Pore Peeling (3) afterwards, to really give my skin a proper detox. Besides masks and peelings, I picked up DHC Deep Cleansing Oil (10) and Mavala Double Lash (2) as my last bits of skincare. Unless you count Chanel CC Cream (8) as skincare too. Though personally I find all double-lettered creams tending towards make up than skincare. To stay on the make up track, I treated myself to Majolica Majorca Puff de Cheek blush in RD414 (4), Chanel Cream Blush in Affinité (5), Chanel Rouge Coco Shine in Pygmalion (9) and Shu Uemura‘s infamous Lash Curler (11). A last minute purchase at the Hong Kong airport were these Kao Steam Eye Masks in Rose, Lavender and Citrus (7). These heat up slowly once you open the sachet and are so comfortable and relaxing on the eyes – perfect for long haul flights! 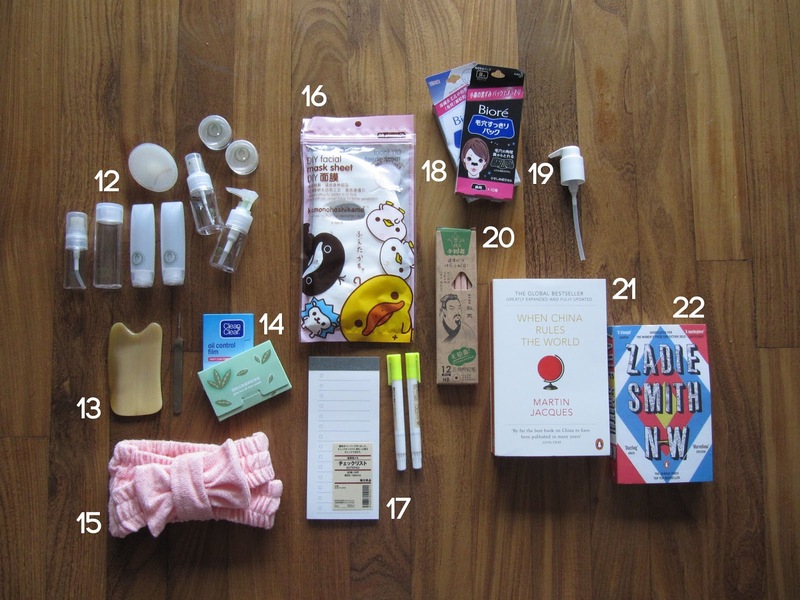 You probably won’t believe me, but I picked up a bunch of handy travel-size empties (12) in a supermarket in China. These are of great quality and kinda beat the MUJI ones, for half the price even. The thing that looks like a paddle actually is a skin brush, great for gentle exfoliating the skin. I’ve picked up a tool that’s used for ‘Gua Sha‘ (13), which basically can be used to massage the skin in such way to get rid of all toxins and improve blood circulation. As blotting papers (14) are rather hard to get hold of in the Netherlands, I stocked myself up pretty well for at least a year. 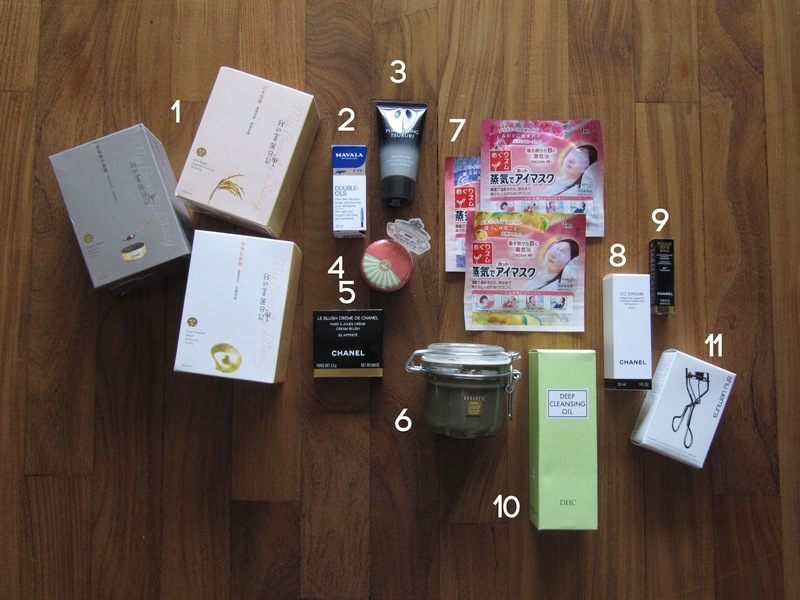 The last beauty related bits are a cutesy head band (15), which I’ll use when doing my evening routine to keep all the hair out of my face, a pack of Watsons DIY Facial Sheet Masks (16), Bioré Nose Strips (18) and an Origins Pump (19). Random, I know. At MUJI I stocked up on my favourite to-do notepad and two markers. Don’t let it fool you, they are actually mad out of wax so it gives a rather cool effect and doesn’t bleed to the other side of the page. I also picked up a pack of pencils at a local shop when I was at my grandad’s, only because I thought the packaging looked quite cool. Of the box, that is. Besides stocking up on beauty in duty-free, I picked up two books at the airport. I got When China Rules the World by Martin Jacques in Hong Kong, as the title drew my attention and the summary at the back completely got me. At Schiphol (Amsterdam, the Netherlands) I picked up N-W by Zadie Smith. Mainly because the cover looked brilliant and when I saw it was about a bunch of people living in London, I had to have it. What did you bring back from your holidays?